A physician’s waiting room is never a great place to spend a lot of time. I thought the above comic was a great spin on the popular book 50 Shades of Grey. You can find more great comics from J. Chang MD on PoorMD. As a father of two kids, I am sincerely grateful that these waiting rooms have more than just gray crayons. 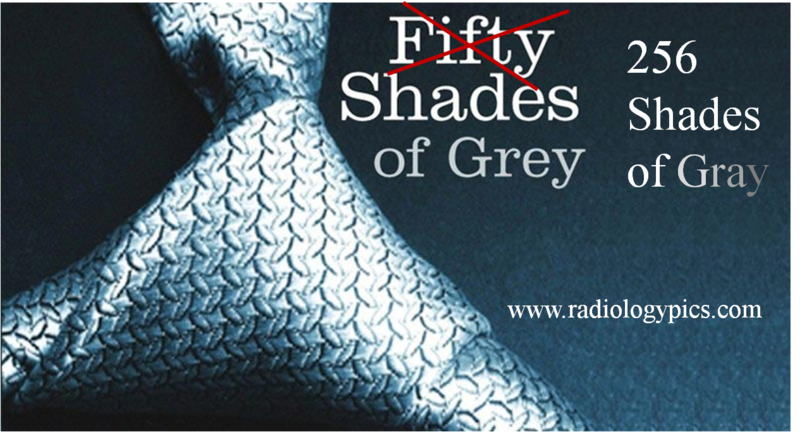 Other radiologists have also devised creative titles, including 50 Shades of Grey Matter by Karl Kruszelnicki. In this book Dr Karl helps the reader navigate through half-baked scientific myths and rumors, so that they emerge smarter, stronger and viewing the world with more wonder than ever before. You can see my spin on the title in a discussion of grayscale physics, 256 Shades of Grayscale.